Membership/Cost: $2 per person (5 and under free), $40 individual seasonal swim pass, $100 family of four seasonal swim pass ($20 additional family member), Free senior seasonal swim pass (62+). Free parking for Altamont residents, $10 parking for non-residents. Membership/Cost: Free for Cohoes residents (must show proof of residency), $5 for non residents. Twenty-fifth St. and Sixth Ave. Cost: Park entry fee $8 per car. Swimming is free. Cost: Daily: $2 adult resident ($4 non-resident), $1 children resident ($2 non-resident), $.75 senior resident ($1 non-resident); Seasonal Pass: $70 family ($225 non-resident family), $40 single ($100 single non-resident). Cost: Park entry $8 per car, Swimming is free. Membership/Cost: Resident-only membership; Daily ID Passes- $4 adult ($6 guest), $2 2-13yrs ($4 guest), free 65yrs and older; Seasonal Passes- $185 family, $135 couple (same household), $120 Single parent and child, $75 adult. Bonus: Residents are encouraged to ask about pool parties. Got the scoop on one not mentioned here? Please share! I was wondering what pool the one in the picture is? Im guessing one of the Spa State Park pools, but wasnt sure which one. Thank! I know you can buy a pass to swim at Lake Myosotis at the Hyuck Preserve, but they don't make it easy. You have to already be a member of the preserve, and THEN you need to pay an additional fee to use the beach, and it's not cheap. I get that it's to deter crowds and also raise money for a worthy cause, but yikes. On the flip side, it must be a very peaceful place to relax, and I know how beautiful it is there. The pic is of the Victoria Pool. Ok so we have an article about swimming pools now, can we maybe get one about good swimming holes/lakes/creeks for the more outdoorsy people of the capital region? Does anyone know more about the "Mater Christi Pool"? I'm confused about the location because the Academy of the Holy Names is on New Scotland Road (not Ave) but I'm not aware of any pool around there. Mater Christi church and school are on New Scotland Ave (at the corner of Hurst Ave) - does the pool have any relation to that? Mater Christi pool is adjacent to the NYS Dept of Corrections training facility on New Scotland Rd. The building was formerly the Albany diocesan minor seminary and its name was Mater Christi Seminary. Huh, I had heard rumors of a pool in that building near the Corrections training facility, but this is the first confirmation. Neat! I love lake swimming and the list here is missing many public lakes. I'd submit a list of all the public lakes I've found in the Capital Region if someone would show me how to post an article. Lakes I go to in Rensselaer County include Snyder's Lake, Reichard's Lake, Crooked Lake, along with Grafton State Park. Collins Lake in Schenectady County has only a shallow swimming area but is a short drive for people in Schenectady or Scotia. Mostly I go to Snyder's Lake because of the convenience to Albany, but Crooked Lake is prettier. I have lots more information, just ask me about it. Does anyone know of any 50-meter (olympic distance) pools in the area? 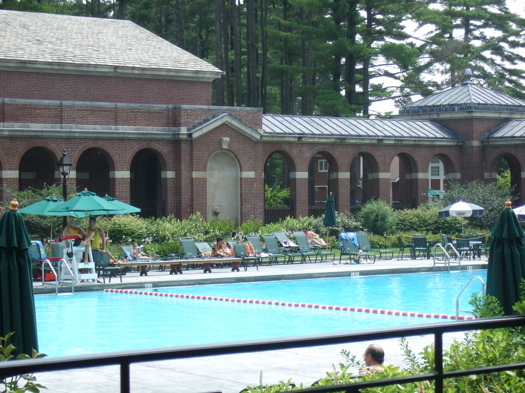 The Cohoes pool only lets "outsiders" in during the weekend and charges $7 and the pool in the Saratoga Spa State Park never sets up for olympic-length lap-swimming. If it helps, I live in downtown Albany. Thanks! i was wondering is there any special rules for lincoln park pool. Mater Christi pool closed two days after it opened - the liner ripped on June 26th and who knows if or when it will be fixed before the season ends. I say let's walk across the street to the Mayor's house and take a dip in his pool! @Sean: actually even if the Peerless Pool (which is my fav in the area) was set up for Olympic length it would not be practical/usable since it slopes from 3 feet back to 0 in the last 10 meters or so in that direction (to make entrance easier for kids). If you find one though, I'm interested too. Quick note about Thompson's Lake State Park (10am-6pm, closed Tuesday and Wednesday, parking $7 per car). It was hot as hell in Thacher Park last weekend so we pushed to Thompson's Lake, a few minutes west. If you are looking for a quick dip when it's "closed" and don't care much for sand anyway, there is free (as in free) access across the beach, on the other side of the lake. Cedar Lane is the "hidden path" that leads to it. @-S, is it legal? We won't be driven out like a horde o' hooligans? @summer: as much as I like trespassing, yes this seems legal. Makes me sad people consider lakes as "private" but in that case no issue, just follow Cedar Lane and stop your car where I marked it, I think it was an old boat access. The lake bed is a bit rocky and weedy but hey, it's not a pool, right? Nobody bothered us. does grafton have a pool or just beach? did it ever have one? I thought I'd try the Albany Lincoln pool today. I live in Albany and I love to swim outdoors in summer. I'm a lap swimmer and this pool is awesome. First, it was almost empty, so I had plenty of room. It's beautiful to look out at the huge pine trees in my peripheral vision. At first I thought the water was too cold, but it was fine once I was in and very refreshing. IT'S HUGE! I'm betting the diameter of the deep area is over 50 meters. Easy in and out. Close parking, lockers (bring a quarter or your own lock) and it's free, open 7 days a week. Very friendly atmosphere, marble showers, classic!